LANSING, MI —The Michigan Association of Superintendents & Administrators (MASA), the Michigan Association of School Boards (MASB), the Michigan Association of Intermediate School Administrators (MAISA), and the Michigan Association of Secondary School Principals (MASSP) applaud Gov. Gretchen Whitmer on a budget proposal that invests in the classroom and recognizes the need for school funding equity. If the Legislature adopts the budget proposed by Gov. Whitmer, this will be one of the most significant changes in the way we fund schools in Michigan’s public education system in a generation. In her first opportunity to give details behind her vision for the state’s public education system, the governor called for an increase in the foundation allowance and asked the Legislature to create a weighted funding formula for per pupil funding. “We are optimistic about this budget as the governor is thinking about education funding in a different way than we have seen from governor’s past,” said Bill Miller, executive director of MAISA. Gov. Whitmer’s proposal would implement a $235 million increase in the foundation allowance. The proposal includes $120 million to increase state reimbursement for special education services and $102 million to increase state support for economically disadvantaged, academically at-risk students. Also noteworthy is $50 million for Career and Technical Education students, which equates to $487 per eligible pupil. “This ‘outside the box’ approach adopts key recommendations from the School Finance Research Collaborative’s (SFRC) work, and gives school districts, rather than the state, more control over how education dollars are spent to meet the needs of our students,” said MASA Executive Director Chris Wigent. Included in the budget proposal was a boost in funding for students impacted by poverty, special education students, and additional funds to increase the number of literacy coaches statewide – a topic that came up during Gov. Whitmer’s State of the State Address last month where she discussed Michigan’s rank nationally for student literacy. "Some students need more supports than others. Our schools provide individualized instruction for each pupil and our state budget should recognize that we need individualized funding based on each student's need," said Wendy Zdeb, MASSP executive director. "The governor's budget is a huge step in the right direction because it recognizes that a one-size-fits-all funding formula and top-down decision making doesn't provide many students with the support they need to be successful." Hello, Michigan Business and Education Innovators! We are pleased to announce the grant application for talent funds will open soon! Thank you for your patience and the time you are taking to move Michigan forward by creating and sustaining innovative solutions to address Michigan’s talent gap and strengthen the state’s education system. The above application steps apply to all funding, except for Converting to a Competency-Based Instruction Model - a talent consortium that ONLY applies for this funding will not need to participate in Step 1 and Step 2. More details on how to apply for Competency-Based funds are coming soon. All three steps must be submitted online using the Grant Electronic Monitoring System (GEMS) – go to www.Michigan.gov/MarshallPlan to get started. how K-12 will adjust its own programming to get students to that industry-recognized credential or postsecondary credit prior to high school graduation to meet the needs of postsecondary partners. Questions regarding the GEMS system can be emailed to Kevin Walters at waltersk5@michigan.gov. Whether this is your first time or second time applying for funds, we strongly encourage you to join our webinar from 3-5 p.m. Friday, March 1. The webinar will include an overview of Michigan’s talent needs and the funds allocated to create and/or expand innovative programs for in-demand occupations, increase career exploration and awareness and invest in educators and students. We will walk you through the innovation grants, the three-step application process and address some of your frequently asked questions. 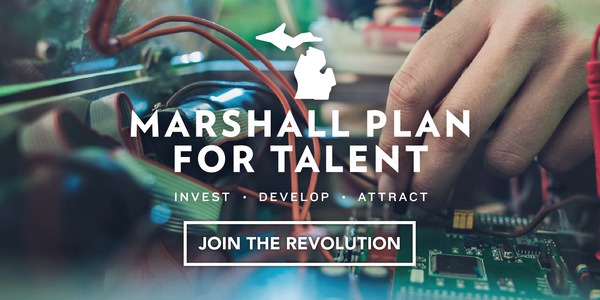 Participants will have an opportunity to ask questions at the end, but we encourage you to send your questions in advance to TED-MarshallPlan@michigan.gov. If this is your second attempt, you can pick up where you left off – but only if you have no changes to your concept summary and/or talent agreement. For example: If your Concept Summary was approved, begin with the Talent Agreement. If your Talent Agreement was approved, begin with the final Grant Application. However, you must notify Kevin Walters (waltersk5@michigan.gov) of your intention to skip steps by March 8. You must provide an assurance that you’ve made no significant changes to your consortium’s Concept Summary or Talent Agreement. If you intend to make changes to your Concept Summary or Talent Agreement (including talent consortium members who would receive funds) you must submit the updated documents and are not guaranteed approval. Welcome to an elite class of innovators! We are here to help you along the way. We will offer technical assistance during Step 1 and Step 2 to prepare you for the final innovation grant application. Thank you for helping us continue moving Michigan forward as a talent development leader. In 2016-17, more than half of the third-graders in Michigan were failing to read proficiently. A statewide Michigan Student Test of Educational Progress (M-STEP) showed that only 44 percent of Michigan third-graders are proficient readers.